Rowing is often called the best aerobic exercise because it offers a total body workout and is low-impact. After you’ve made the purchase and have your rower set up, it’s time to craft your initial workout parameters. 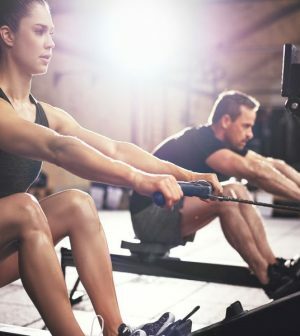 The intensity of your workout depends on two factors: the resistance setting; and your stroke rate — the speed at which you row. If you’re a beginner, start with an easy five-minute warm-up, aim for 15 minutes of rowing, and then finish with a five-minute cool-down. As you progress, gradually increase resistance and/or stroke rate. Note that a slower stroke rate with high resistance may hurt your back, especially if these muscles aren’t strong. In fact, if you have a history of low back pain, have a trainer teach you the proper rowing technique to prevent injury.